Everyone wants to retain their existing customers. Few companies, however, are implementing positive strategies aimed at retention. Most companies are organized for acquisition. Their advertising and sales programs are designed to find and promote their products and services to new customers. The companies are organized on a product or brand basis, not on a customer segment basis. While they all have customer service departments, and most have a customer service toll free number, they lack an integrated marketing strategy that is directed at retention, and that defines retention as the measurement of success. In this article, we will explore the meaning of a retention strategy, showing how it can be set up, and how lifetime value can be used to measure it. You have often heard it said that “It is five times more profitable to spend your marketing dollars to retain the customers that you have than to use the dollars to beat the bushes for new customers.” Most people would agree with this statement, even though they have no way of proving it. Indeed, the majority of large American and Canadian firms today are experimenting with database marketing programs aimed, in large part, at retention. Most of these companies are not yet sure whether their experiments will be successful. A significant number of the programs will fail and ultimately be scrapped. How do such programs work? Let’s look at the theory. I like to go back to the old corner grocer. Prior to 1950, most groceries in the US and Canada were sold in small grocery stores. The proprietor would meet you at the door. He knew you by name. He knew your preferences. He would put things aside for you. He built his business through recognizing his customers and doing favors for them. Customers were loyal to these stores because of the recognition and personal attention they received. These small stores have been virtually wiped out through the advent of supermarkets. Supermarkets have a much wider variety of goods. The average grocery store had 800 SKUs on their shelves. Supermarkets today have 30,000 SKUs. Mass marketing took over. Prices came down. Variety increased. Food purchases fell from 31% of the average family budget in 1950 to about 10% today; yet the food we buy with that 10% is better in quality and quantity to what we bought with 31% in 1950. We have all gained. At the same time, we have lost something valuable. Companies today have tens of thousands– in some cases millions– of customers. We do not know who they are. We cannot recognize them and talk to them as the old corner grocers did. Loyalty has disappeared. Customers are loyal until tomorrow’s newspaper, when they see a coupon for something at another store and – woosh, they are gone. What is true of grocery stores is also true of department stores, drug stores, hardware stores, office supply stores, banks, movie theatres – virtually every sales organization today. What has begun to change this picture has been the advent of computers. In the past 15 years, computers have become so sophisticated and powerful, and their prices have become so inexpensive, that it is possible to keep in a computer today the kind of information that the old corner grocer kept in his head, and to use that information to recognize and do favors for our customers. By setting up a customer database, and using it to start a dialog with their customers, some companies have been able to reestablish contact with their customers designed to build loyalty, referrals and repeat sales. Retention building is possible. There is one key principle at work here, however. Database marketing only works to build retention if the customer benefits from the retention strategies. It works if the customer says to herself, “I’m glad that I’m on that database, because…” The company running the database has to complete the sentence by designing and running programs that capture the loyalty of their customers. If the customer does not see some value to herself in the database activities, she will chuck out your newsletters unread. She will ignore your communications. She will leave your gold cards in her top bureau drawer. 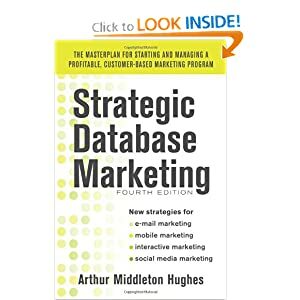 For the database program to be successful, the marketer must design the program from the customer’s point of view. If you can come up with a strategy that makes customers happy, then they will reward you with something that you want, but which costs them next to nothing: loyalty. What are these strategies? Databases that keep track of customer’s purchases, preferences, complements and complaints, which are used to carry out loyalty building services and dialogs. Integrated marketing programs where the advertising, direct communications, customer service, database marketing and sales programs are all orchestrated together and designed to build loyalty. Segmentation of the customer base by lifetime value groups, and different marketing programs designed for each segment. The gold customers should not be bombarded with marketing programs. On the contrary, they should be rewarded with super services. These are 80% (or some other large percentage) of our revenue. We must retain these loyal folks. We spend our marketing dollars on the middle three quintiles: encouraging them to move up, to get in to Gold Heaven. On the other hand, the bottom quintile may be costing you more than they are worth. Don’t waste marketing dollars here. We don’t want to retain them. How can the success of these programs be measured? The answer is lifetime value. Here is a typical lifetime value chart for Fast Lube – prepared with no contact with or data from the company itself. In this chart, we track 100,000 Fast Lube customers during their first three years with the company. Their initial retention rate is 55% — 45% of their newly acquired customers do not come back again. The retention rate grows in the second and third years. The spending rate is largely a function of the number of times that customers change their oil during a year. As you can see, the average customer does so only twice a year. It costs Fast Lube $15 each to acquire a new customer through advertising and other forms of promotion. Lifetime value calculation may not be familiar to all readers, so let’s explain some of the terms. We are tracking here 100,000 specific customers on the Fast Lube database. When a customer comes in for an oil change, they capture the name and address, phone number, license plate, car make, model, and year, the date, and the products purchased. This data is stored in an online database which can be called back up at any time by using the customer’s name or license plate number. The retention rate can be determined by tracking the number of newly acquired customers who return for service in the second year, or second quarter, after acquisition. As shown here, the average customer changes his oil every six months. This number rises in subsequent years. Direct costs are estimated at 65% of revenue. The discount rate is used to discount future profits so that they can be compared and added to present profits. The formula for the discount rate is D = (1 + i)n where i = the interest rate and n = the number of years. The lifetime value is obtained by dividing the cumulative net present value profit by the number of originally acquired customers (100,000). In other words, lifetime value is the value of a newly acquired customer. As you can see, it rises to $34.41 in the third year after acquisition. they decide to send post cards to people three months after each oil change, suggesting that people return for another change. in addition, they will train these customer reps to give the customer a post card that he can use to provide the name of someone else who could and should use Fast Lube service. Fast will send this person a personalized letter and a coupon. If the referred person uses the service, the referrer will get $20 off on their next oil change. In this chart, we are able to see the effect of the adoption of these new strategies. The referral program is producing more than 5,000 new customers per year. It costs $20 per acquired customer – a little more than the current acquisition strategy. However, experience has shown that referred customers, in general, have a better retention rate and spending rate than customers that walk in off the street. They are a bargain. What this shows is that if the new strategies were to be adopted, the net profit, after all expenses have been paid, is almost $3 million dollars, assuming that Fast Lube uses the strategies on 100,000 customers. If the strategy is tested in a given group of stations, and it works, it could be extended nationwide with similar profitable results. This is the way that lifetime value analysis is used to test the validity of loyalty building strategies before serious money is spent on them. In the past, companies have had to bull ahead and try new ideas without any really good way of measuring the effectiveness. Lifetime value gives them a valuable tool. It is a forward looking concept. Where do these numbers come from? Some of them are estimates based on previous tests. Some are assumptions that can be tested through experience. A key consideration is that they are all testable numbers. A year later, we can look back and find out exactly what our retention, referral and spending rates were. We can improve our projections. We can try out new ideas on small segments of our customer database, either geographically or by spending segment. When we have made our mistakes and have learned what works, then we expand our strategies to larger segments of our customer base. Lifetime value analysis provides a basis for getting the annual marketing budget approved. Advertising has to rely on awareness estimates. Database Marketing relies on strong, specific, provable numbers which can be quite convincing to a CFO when he understands them. More and more companies today are using lifetime value analysis to test and improve their retention strategies.